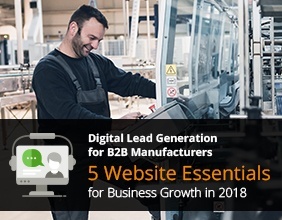 Is Your MFG Firm Positioned for Strong Lead Generation? B2B manufacturers, find out what your marketing is missing – and get practical, data-driven strategies for selling to today's buyers and growing revenue! PMG recently conducted an analysis of 100 manufacturer websites. Our goals? To identify critical marketing trends across this diverse industry – and to help industrial firms pinpoint exactly where their sites need the most help. The wow-worthy results inspired us to launch this webinar. During the session, PMG principal Susan LaPlante-Dube teams up with HubSpot business development expert Katie Carlin to dig into the data from our recently published report and provide professionals from the industrial manufacturing space with practical, digitally-based solutions for generating and nurturing quality leads. Plus, we wrap with a Q&A session for attendees. Your website is your greatest marketing asset. It’s your 24/7 salesperson. And it can help you grow your business exponentially. But it can’t work for you without the right ingredients. Let's get your site in shape for 2018! Simply fill out the form to watch the recording! Prior to turning her career to marketing, Susan LaPlante-Dube implemented ERP systems in some of the world’s largest brands. From there, she moved on to marketing professional services, then software, and since 1999 has been working directly with a wide range of B2B manufacturers and other companies, helping them create and implement effective, practical marketing strategies and programs that deliver results. Katie Carlin was one of HubSpot's first business development hires. She's spent the past 5+ years scaling internal global programs while helping hundreds of B2B businesses hit their revenue goals through the implementation of online marketing best practices. Katie works closely with CEOs, CMOs, and VPs of Sales & Marketing to adapt their growth strategies to match the modern buyer's journey. She also consults several Boston-based environmental services, technology, and manufacturing companies on both digital growth and sales & marketing alignment.